The transportation industry and the green environmental movement have traditionally been considered at odds with each other. At Biagi Bros., we are working hard to combat the negative perception that the transportation and logistics industry puts the interests of profit above green transportation and environmental responsibility. Because we have had the tremendous good fortune to be able to live and work in the Napa Valley region, viticulture, agriculture, and the environment are always at the forefront of our minds. It would be counter-productive and irresponsible not to do our best to protect the very resource that has prospered and graced all of us with such plenty. You could say that the Napa Valley seems to inspire us to a “green” state of mind. If there is a greener way to accomplish something, we go out of our way to do it. One of our more recent initiatives relates to our warehouse lighting. We are systematically replacing old metal-halide lights in our warehouses with motion-sensor fluorescents. This new, on-demand lighting carries with it a tri-fold benefit. The fluorescent lighting expends approximately 70% less energy while producing the same, if not a superior, level of illumination. In addition, motion sensors enable energy consumption to be lowered even further because only the areas in the warehouse experiencing activity are being lit. Finally, metal-halide lighting emits a tremendous amount of heat. Because our warehouses are temperature controlled, cooler fluorescent lighting results in far less energy consumption by our air conditioning. We also began implementing radio frequency tracking for warehouse management in 2010. The system uses bar code scanning technology which increases efficiency in the warehouse with the eco-friendly bonus of eliminating the need for paper. 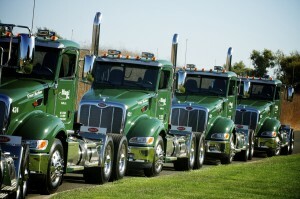 “green machines” – the new low emission highway tractors manufactured by Peterbilt. Taking advantage of the clean air grants by the State of California has helped enable us to replace more than a dozen of our oldest trucks with the new low emission ones. Along with the environment, our customers are beneficiaries of the new trucks as well because every measure we take to suppress our own costs translates into savings for our customers. At Biagi Bros, we want to be at the forefront of bringing the latest in green technologies to both our transportation, logistics and warehousing operations. We may not be able to impact the whole planet, but we want to do the best we can to take care of our corner of it by reducing our carbon footprint in our warehouses and on our nation’s highways. What are some of the green innovations that your place of work has come up with? We’re always interested in new ways of going green. If you are in need of warehousing, logistics, 3PL, supply chain management and/or transportation services or you would like to work with a company that’s progressive and green conscious, contact us at Biagi Bros.